Strengthen the interaction between industry, Government & Policy Makers and knowledge institutes. Provide a platform for dissemination of results delivered by the TDL and EEMA ecosystems. Stimulate and refresh the ecosystem with new content from both outside and inside the industry. Provide a platform with impact for sending out messages to influence government and industry. Connect the relevant EU projects to the ecosystem to stimulate dissemination and collaboration. Project our vision, strategy and content to “non-members”. 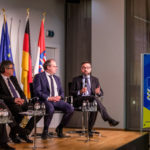 There will be a mixture of practical demonstrations, presentations and panel discussions covering the key challenges, visions and strategies related to the European Cyber Security Strategy. Each panel discussion will have representatives from Government & Policy Makers, Knowledge/research institutes and industry (use case studies).